Ever since its opening last year, I've been meaning to bring my kids to check out the new National Gallery Singapore, which was previously the Supreme Court. We started with the Art Corridor, an interactive art wall for kids to learn about colours and shapes. My boy loves the Art Corridor and would have stayed there all day if not for my insistence (and curiosity) to explore the rest of the gallery. Right: Posing with a real-life cartoon tree. Like a pop-up cartoon card. Very cool! Picture of me with the kids. Must take more pictures of me with the kids before they grow too big for me! We spent about close to an hour here before heading to another attraction close by called Who's in the Woods. It's an interactive display where kids can colour an animal of their choice and it will be displayed on a screen. Both my kids loved it! The kids wanted to do a few more but I didn't allow them because we wanted to allow other kids a chance to play as well. 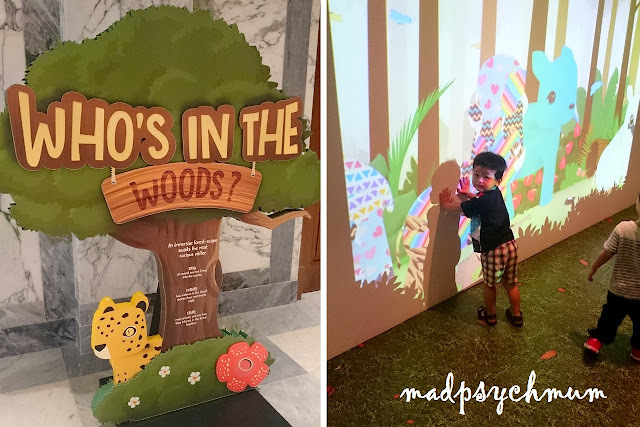 We proceeded to the "adult" section of the gallery, which requires entry fee if you are not a Singaporean or PR (if you are, it's free). There was a photo booth for visitors to take pictures with their biggest painting (the actual painting is below). It's in line with the gallery's move to make their displays more interactive. With the actual painting in the gallery. One of the biggest paintings I've ever seen so far in Singapore. 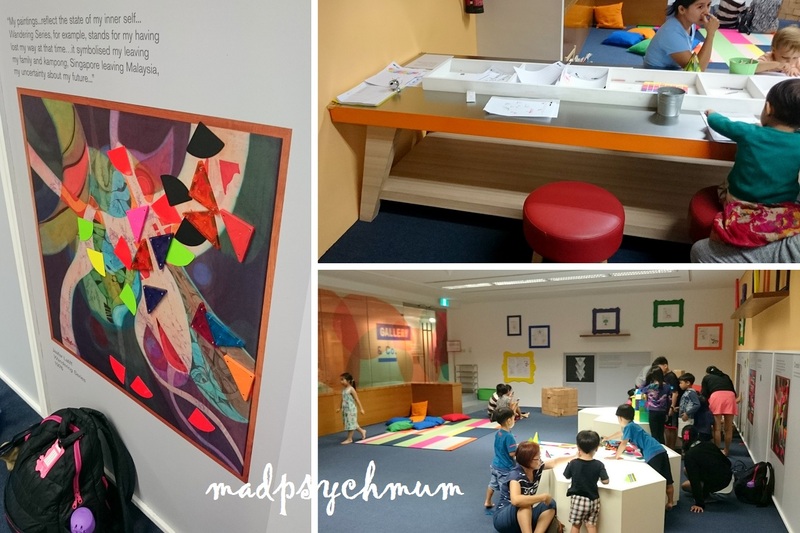 As we explored the rest of the gallery on Levels 3-5, the staff kept giving us questioning looks and asking us if we knew that there was a kids museum at Level 1. I think they were afraid that my kids will destroy the art installations. Feeling a bit unwelcomed, we decided to head back to the "kids" part of the gallery where we were more welcomed (besides, it was more fun). Eventually my boy got bored and we had to move to the Children's Museum located next door. 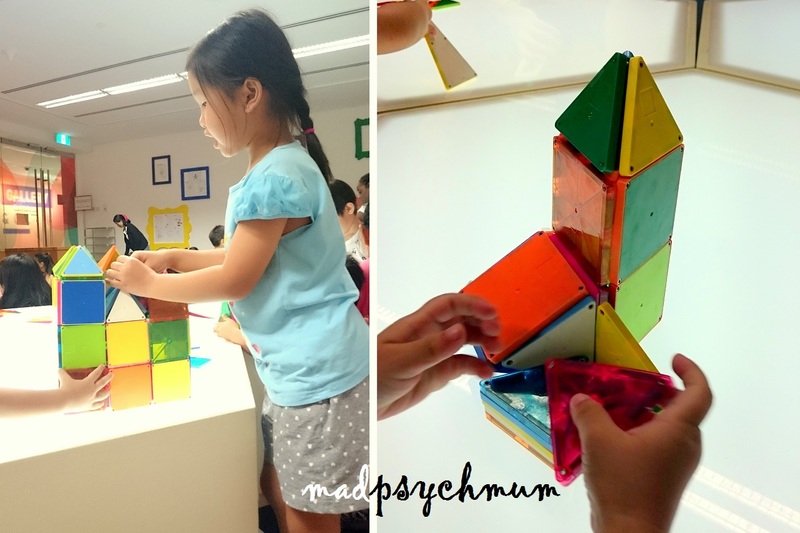 It was fun as the kids can have as much fun as they liked playing with shapes and colour. 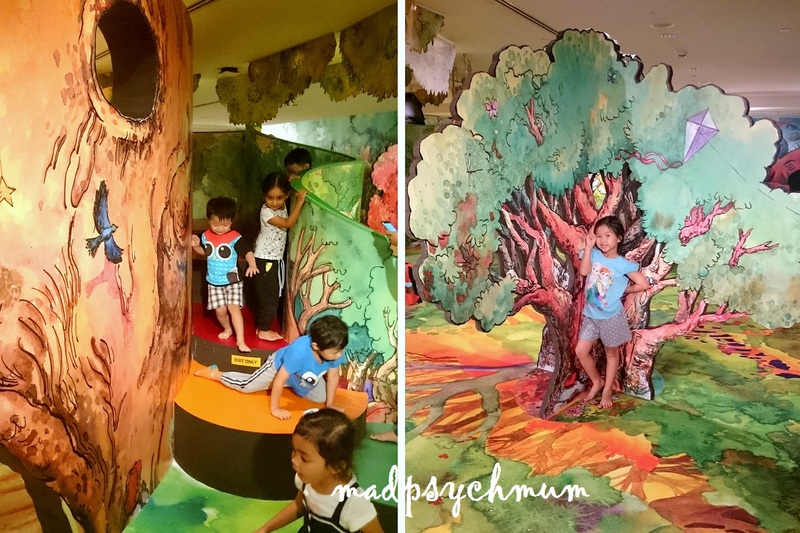 The small room with various activities and things to do for the kids. Girl and her competed structure!